This section deals with the construction of the Internal Reflux still condenser assembly. If you plan to build the Valved Reflux model, please click here. In the context of a still, the condenser is a device that cools down whatever hot vapors that flow through it to the point where the vapors condense into a liquid. The condenser in this model is the most important part of the assembly because it controls the internal re-distillation process and the separation of the final output. 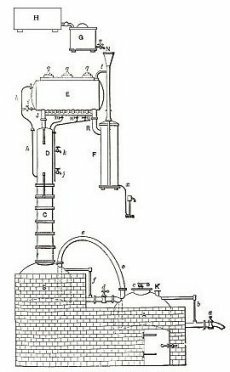 The traditional reflux still design, shown on the left, includes a condenser and holding drum mounted at the top of the column. The holding drum is fitted with valves that allow the distillate to be routed back into the column, or directed out to a collection vessel. The still we are building in this section, has no condenser or reflux holding tank at the top, and no valves to control the reflux flow. Instead, The reflux is produced inside the column by cooling tubes that pass through it. In this model, both the distillate output and the reflux flow are controlled by the amount of water that is circulated through the condenser shell and the cooling tubes that pass through the column..
Condensers can be designed in many ways, but for a lot of reasons, as you’ll see in the next paragraphs, a jacketed core condenser is particularly well suited for this still. With jacketed condensers, a circulating and cooling water supply runs between the jacket and the core. This condenses the liquids contained in the hot vapors coming from the column and going through the core. Simple as it might seem, there are a lot of considerations behind making a proper condenser for the kind of column we want to build. Most low capacity distillation devices use a small capacity condenser. This is because they are designed for only one purpose: to drop the temperature of the distillation vapor to the point where the liquid separates out of the vapor. That usually does not require a great deal of cooling. Pot stills sometimes just use a coil of tubing that cools the vapor by just exposing it to the surrounding air temperature. But keep in mind we are building a reflux still. That is a more sophisticated design. In the course of its operation, the reflux still produces a much higher quality of distillate than the pot stills because it effectively re-distills the mixture many times before it is drawn off from the still. That of course, requires much more cooling and much better temperature control than the simpler pot stills. So, to accommodate these needs, we’ve designed this still with a much larger cooling capacity incorporated into the condenser. We’ve done that because we need not only the cooling required to condense the distillate vapors, but also to carefully regulate and control the temperatures inside the reflux tower. To properly utilize the extra cooling capacity, we’ve made the water supply and drain lines from ½" copper pipe and run these cooling lines through the reflux column as part of the normal cooling circulation. The primary purpose of these lines is to control the amount of re-distillation (reflux) that occurs inside of the column.